Papilio Pro Low Cost FPGA Open Source Board Arduino Compatible! Looking to expand your horizons beyond the world of fixed microcontroller chips? If you are looking to jump into programmable integrated circuits (IC), Field Programmable Gate Arrays (FPGAs) development circuit boards are the way to simultaneously process large data very fast. With FPGAs, the circuit design is not set and you can reconfigure an FPGA as many times as you like, allowing you to create as many serial ports as you want and decide what pins the serial port connects to without having to use software to emulate a serial port (all you would have to do is modify the VHDL code and implement the serial ports). That's the beauty of using an FPGA dev board. You start out with a Soft Processor and then you can add peripheral functionality as needed and simply rewrite the hardware to include it. Papilio Pro is one such development board which comes with Open Source Arduino compatible Soft Processors and features USB 2.0 for JTAG programming and serial comms, 64 Mbit SDRAM, 64 MBit SPI flash, 64K Block SRAM, DSP Slices, Clock Management Tile, Multi-Boot, and an efficient switching power supply. With Papilio Pro you can use it in combination with the RetroCade MegaWing to generate retro audio. Also, with the Papilio Pro you can test out the logic analyzer feature on an oscilloscope or even turn the Papilio Pro into a logic sniffer and logic analyzer. In fact, if you have been using an Arduino UNO as a logic analyzer, you can do the same with the Papilio Pro and achieve 32 channels at 200 MHz with 3.3 V (and 5V signals as well by adding a level translator). Development boards such as Papilio Pro allow you to harnesses the power of FPGA thanks to Papilio's open-source hardware and software project. 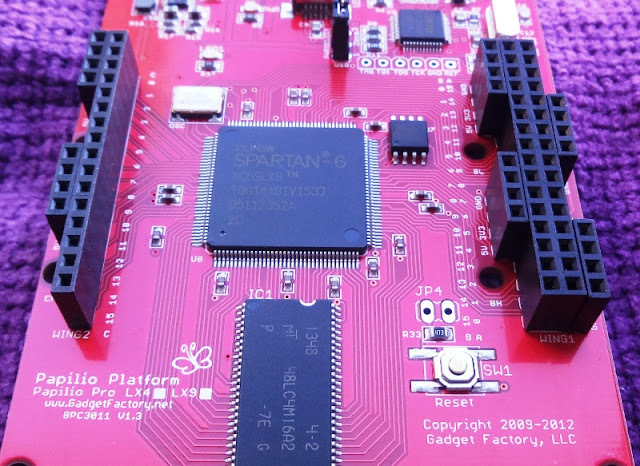 Papilio Pro is a very powerful development board based on Xilinx Spartan 6 LX FPGA chip. 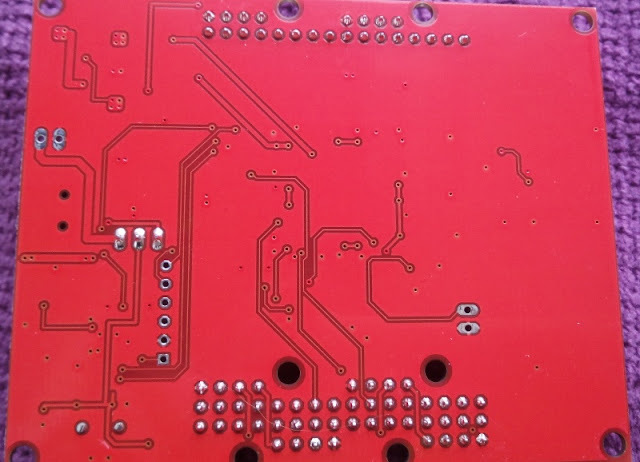 It is a low cost Open Source FPGA board with everything you need to get started in the world of FPGA and you can design and prototype your ideas and expand the board's functional capabilities by adding Arduino-like shields called Papilio Wings. Papilio Pro has a nice vivid red layout and simple board that features the processor Spartan 6 LX9 and memory MT48LC4M16, providing only a "controllable" LED user as well as the electronics required to program via USB, which is great as you won't need a programming cable from Xilinx that more expensive development boards require. To get started using the Papilio hardware, you will need to get the file associations setup and install the drivers, Papilio Loader and download the ISE Design Tools 14.7 for programming in VHDL. Getting a VHDL design up and running on the Papilio Hardware is simple.